TheUnited States Air Force plans to launch its first robotic X-37B space plane Thursdayon a mission that is a forerunner of things to come. A second mini-space planeis already under contract and is projected to be launched next year. Newdetails regarding the mini-spaceplane and its upcoming Thursday liftoff atop an Atlas 5 booster werediscussed today during a U.S. Air Force-held media press briefing. ?Aftera tumultuous history of sponsorship, it?s great to see the X-37 finally get tothe launch pad and get into space,? said Gary Payton, U.S. Air Force DeputyUnder Secretary for Space Programs in a media press briefing today. Thesmall X-37B spacecraft resembles a miniature space shuttle and is equipped withits own payload bay about the size of a pickup truck bed ? ample space to holda couple of small satellites that are a few hundred kilograms each, Payton noted. Accordingto released specifications, the X-37Bspace plane weighs about 11,000 pounds and is just over 29 feet in length.It stands slightly more than 9 1/2 feet in height and has a wingspan just over14 feet across. Theinitial X-37B flight is designed to loiter in space up to 270 days. Afterretracting its solar array and closing payload doors, the space plane would re-enterin automated mode. ?It?son auto-pilot, literally, the entire time the rest of the way in,? Payton toldSPACE.com, adding that the Air Force is ready in case the spacecraftmalfunctions. ?We?ll be tracking it over the Pacific...and it does have adestruct mechanism on it." TheX-37B is designed to make an autonomous landing at Vandenberg Air Force Base inCalifornia, or at neighboring Edwards Air Force Base as backup. ?Similarto the shuttle, it?ll take half-the-world to come home,? banking on redundantdigital flight control systems on the vehicle, Payton said. "I?ve got alot of confidence in the ability of this bird to come back home autonomously." 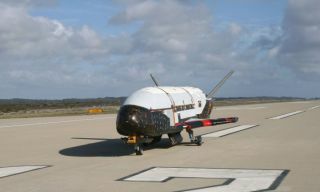 Fastturnaround of X-37B, Payton told SPACE.com, could be measured in several daysto 10 to 15 days or less. ?I?d like to see this X-37 handled much more like anairplane,? he said, likening that ability to the SR-71, an advanced, long-range,Mach 3 and faster strategic reconnaissanceaircraft. Thenew unmanned space plane will test a new batch of reusable technologies,including new silica re-entry tiles, as well as ?other technologies that aresort of one generation beyond the shuttle,? Payton said. Alreadyon order is a second mini-space plane. ?Wedo have a second tail number on contract. Currently, we?re looking at a 2011launch for that second tail number. That assumes everything goes properly aspredicted on this first flight,? Payton said. Additionalcopies of the mini-space plane ?depends on success of these first two birds,? hetold SPACE.com, and if operations and maintenance costs are low and fastturnaround times are achieved. TheX-37B initiative leverages extensive and early NASA, DARPA, Air Force, as wellas investments by its builder ? Boeing Phantom Works. The funding level for theoverall project is within the Air Force?s classified budget, explained AngieBlair, an Air Force spokeswoman for the project in an earlier interview. According toinformation released by the U.S. Air Force, the X-37BOrbital Test Vehicle (OTV) will provide a flexible space test platform toconduct various experiments and allow satellite sensors, subsystems, componentsand associated technology to be efficiently transported to and from the spaceenvironment where it will need to function. The X-37B will alsoprove new technology and components before they are committed to operationalsatellites. The OTV is the first vehicle since NASA?s shuttle orbiter that has the abilityto return experiments to Earth for further inspection and analysis. ?The X-37B is the only self-contained effort intended to be an economicallyviable experimental test platform on-orbit for months at a time and thenreturn,? said David Hamilton Jr., the Air Force Rapid Capabilities officedirector in a recently released article by the Air Force. Hamilton explained the X-37B is a risk reduction vehicle for spaceexperimentation that explores concepts of operation for a long-duration,reusable space vehicle. Hamilton explained that the OTV has the potential ?to revolutionize how the AirForce operates in space by making space operations more aircraft like andadding in the capability for returnable plug-and-play experiments. ?